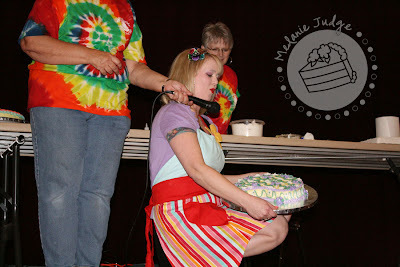 Panhandle Cake CRUMBS – LIVE 1-Tip Contest! 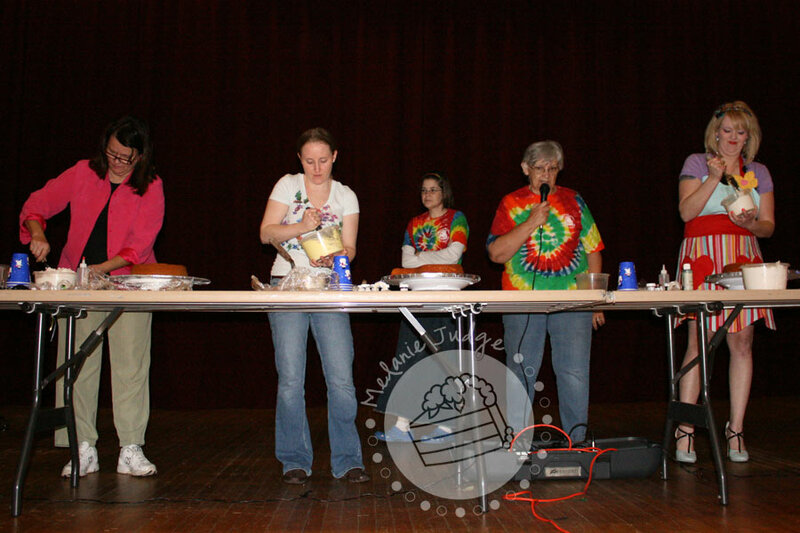 During the 2011 Panhandle Cake CRUMBS Competition, they have a couple of live mini-competitions to keep the crowds entertained. Susan, show chairman, asked me to participate in the 1-tip competition. 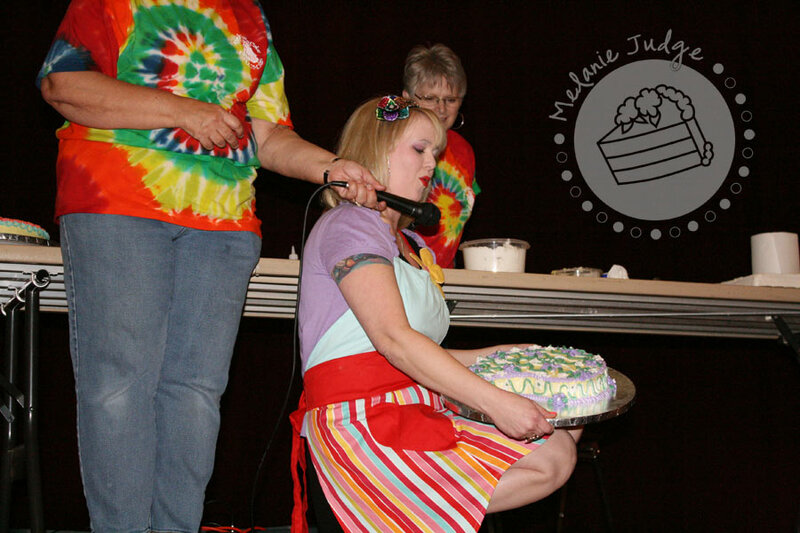 The idea is that 3 different cake decorators are given all the supplies they need to decorate a cake – spatulas, icing, piping bags, colors, etc. – and only ONE decorating tip. The decorating tip is kept a mystery until just before the competition. So, you can pretty much expect to see some crazy tip that no one ever uses anymore! Well, I’m a nerd at heart so I brought a few cake decorating books in the car with me. I was hoping to study up on some of the weird tips. I mean, we had a 5.5 hour drive to the competition so I might as well use my time wisely, right? Well, it didn’t help because the tip we were given was not in any of my books! Bummer! 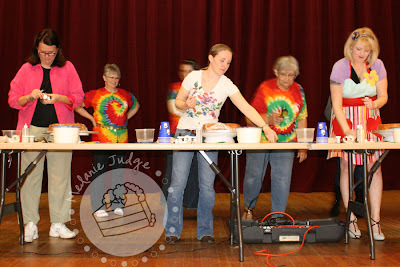 I started the competition by dropping one of my spatulas on the ground. Whoops! Luckily, they gave us a bunch so I didn’t have to use the dirty one. 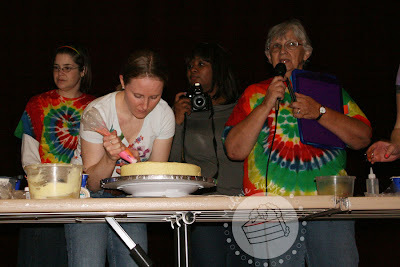 Then I colored my icing yellow to add a pop of color to the cake. After I got my cake iced, I colored the rest of my icing 5 different colors. I figured, I’ll get the mixing overwith so all I have to do is decorate! 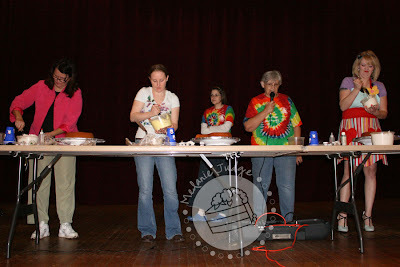 Did I mention we had 30 minutes to complete our cakes? Yea, that’s pretty fast. After I mixed all 5 colors, I realized we only had 3 piping bags. So I loaded 2 colors in one bag. If you look really closely in the picture below, you can see the pink on the bottom of the bag and the orange on the top. 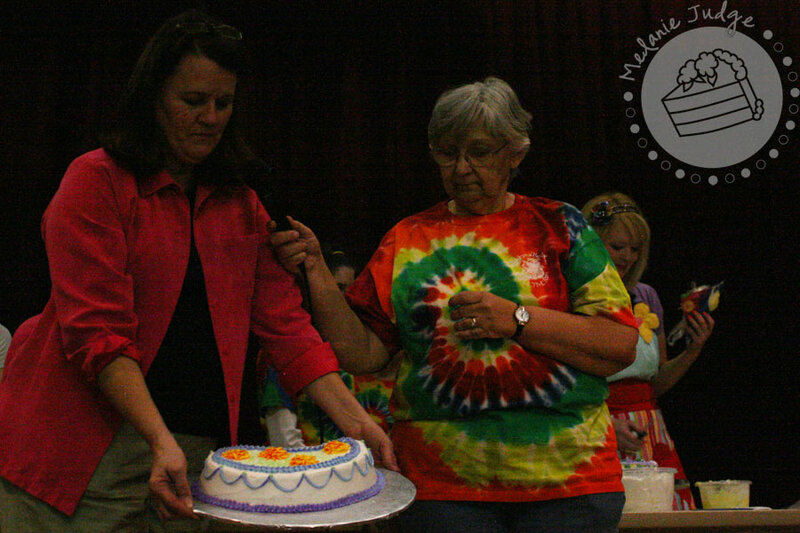 It created a pretty cool effect on the cake when I piped the border. Then, I taped off half of the tip, loaded a bag with blue icing, and piped stringwork around the outsides. Now, of course, I did this part in about 5 minutes so it’s not even or consistent. But I had to do stringwork – it’s become sort of like my signature at competitions lately. And you can’t tell from any of the pictures Adam took, but I also piped flowers and polka dots on top of the cake. 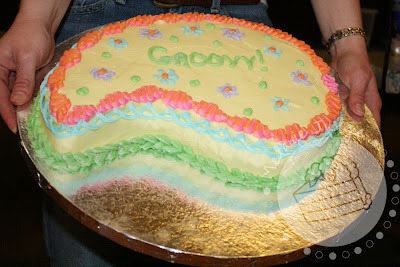 Oh, and the word “groovy” since it is a 1960s-themed cake competition! 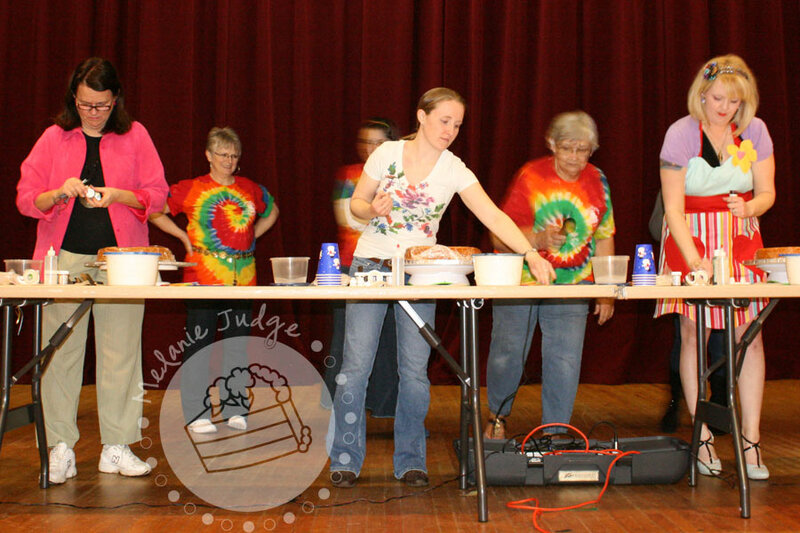 Now to present our cakes to the audience! And the winner? Surprisingly enough, me! 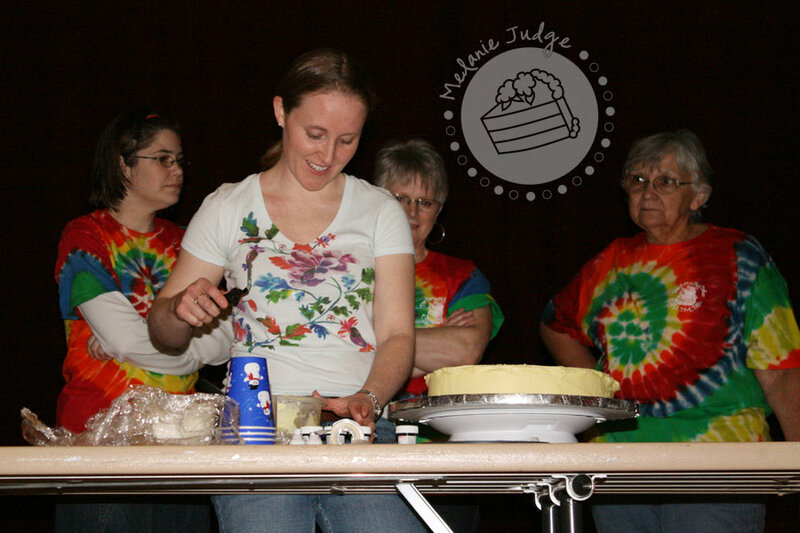 Susan said the judges (those people hovering in the background of the pictures above) chose the winner based on the creativity of using the tip, the overall design, and the relevance to the competition theme. 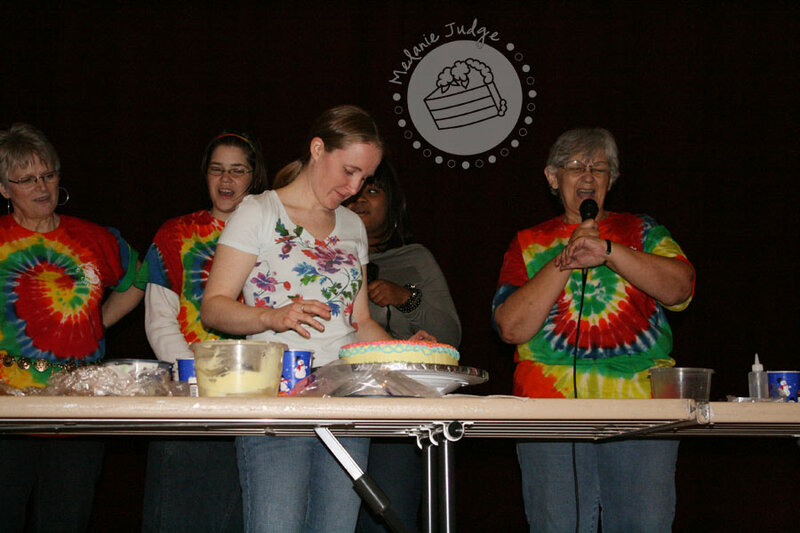 I’m sorry that we didn’t get a better close-up of all the entries, but trust me when I say they were all great! So different and so creative!